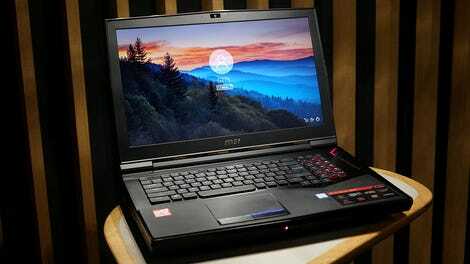 MSI’s GT75 is a laptop in name only. Measuring 2.2-inches thick and weighing over 10 pounds, even the mere thought of lugging this thing aroud makes my back hurt. Oh, and did I mention that’s before you factor in that this 17-inch gaming behemoth requires not one, but two separate power bricks, which combined adds another 4.5 pounds? A giant 17-inch gaming laptop. It’s ridiculously fast, it’s display is super sharp, and it’s keyboard is solid and colorful. It’s heavy, loud, expensive and requires two massive power bricks. But what this thing lacks in portability, it more than makes up for in performance because as the first system available with one of Intel’s brand new Intel Core i9 CPUs, the GT75 is simply the fastest laptop we’ve ever tested. And when you combine that chip with a mountain of RAM and a terabyte of m.2 storage configured in Raid 0, typical synonyms for fast like brisk, blazing, or even blistering don’t really feel adequate. So even though the GT75's bulk and outrageous $3,300 starting price ($4,500 as reviewed thanks to some extra RAM and storage) won’t ever make sense for more than a handful of people, if you truly, desperately, value speed over everything else in a laptop, this monster is exactly what you need. Now before we dive into the system’s guts, let’s start with the GT75’s design, which actually hasn’t changed that much from last year’s model. Its body feels solid enough, and doesn’t have any of the flex or bending I found on the GT75’s smaller and more affordable sibling. The exterior is mostly made up of smooth brushed aluminum, though despite my best efforts to keep it clean, it’s fingerprint-loving nature always cause it to look a little greasy. As expensive gaming PC’s are wont to do, the GT75 also sports customizable RGB lighting in its keyboard, that lets users set each individual key to a different color, in addition to two more configurable lights hidden in the laptop’s discrete left and right mouse buttons. This is the mess of bricks and wires you need to bring if you’re considering moving the GT75. Along the sides are USB 3.1 Type-A ports, an SD card reader, and a frankly unnecessary number of 3.5mm audio jacks. Meanwhile, around back, there’s another USB-C port with support for Thunderbolt 3, along with HDMI, miniDisplayport and a big fat connector for power, which brings us to what is easily one of the GT75’s most quirky features: dual charging bricks. I think we’ve found where all the 3.5mm jacks that smartphone companies keep axing have ended up. With an energy guzzling 45-watt CPU, big fans, and an Nvidia GTX 1080 inside, MSI had to equip its laptop with two pipes to keep the system properly powered. It’s a cumbersome rig that consists of twin two-pound plus power bricks that are joined by a Y-shaped breakout box, which in some ways, is more annoying to carry around than the actual laptop itself. And if you plan on moving this thing around, leaving those wires at home isn’t really an option, as the GT75 lasted just 2 hours and 53 minutes on our battery rundown test. Those air intakes in back look like they would be better suited on a sports car. The RGB light behind each key can be customized individually. There’s no dancing around it, the GT75 has got an excess of speed. On Geekbench 4, the laptop’s six-core Intel i9-8950HK CPU hit 23,425 on multi-core performance, 30 percent higher than its closest competitor, the GS65, which isn’t exactly a slouch thanks to its 8th-gen Core i7 CPU, the next step down below the GT75's Core i9. Results were similar, though not as pronounced on our Photoshop picture resizing test, which saw the GT75 cut completion time by 10 percent. But the real joy comes when you’re gaming. This thing is made for blasting out graphics at super high resolutions. On ultra settings at full HD, frame rates in Rise of the Tomb Raider and Far Cry 5 were above 100 fps. In fact, it wasn’t until I bumped things up to 4K in Far Cry that the GT75 even struggled, hitting a still respectable 41 fps with essentially every bell and whistle turned on. Meanwhile, less demanding games like Overwatch, even on epic settings, ran at over 80 fps in 4K. While the GT75 is probably capable of going even higher, MSI’s Dragon Center makes it really easy to overlcock both CPU and GPU performance. And all these numbers were before I played around with the GT75’s overclocking features. Using MSI’s Dragon Center software, you can tune the performance of each of the CPU’s six cores and increase the GPU’s core and vRAM clock speeds, which after I set everything as high as it would go, boosted fps in Far Cry 5 to 46 fps. Now that might not sound like a huge improvement, but getting 10 percent faster performance just by checking some boxes and moving a few sliders around is pretty nice. And despite the little warning that popped up after overclocking the GT75 as high as the Dragon Center would let me, the system was stable, and didn’t suffer from any issues or unexpected shutdowns that can sometimes happen when you’re trying to push things above stock speeds. Look, the GT75 is an unwieldy beast. It’s big, heavy, and its price tag alone is enough to scare off most buyers. But consider the alternative. Trying to travel with a desktop tower featuring this kind of performance plus a keyboard, 4K display and mouse is going to be even more difficult than dragging the GT75 around. 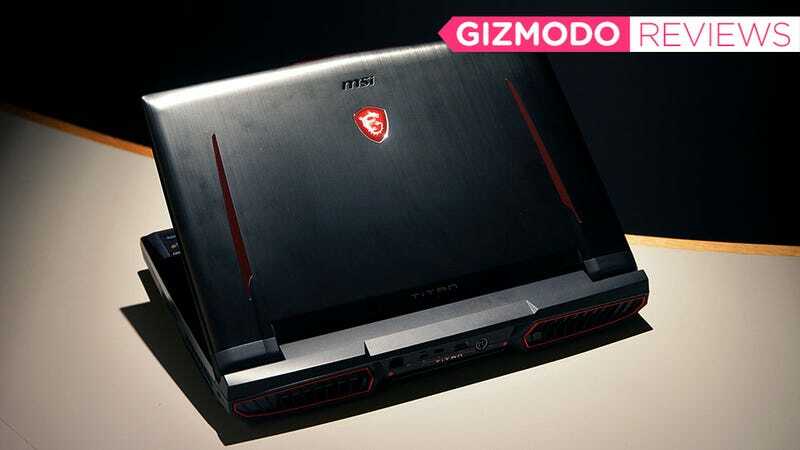 As just a showpiece for how much horsepower you can pack in a laptop, the GT75 surpasses everything else on the market right now. And that’s before you consider other little treats like the system’s stupidly loud speakers, optional 120Hz full HD, and nifty Killer multi-gig networking. Then, you look over at other gaming brands like Alienware and Asus who are also working on $3,000+ laptops with Core i9 chips, but aren’t quite ready to actually ship them out, the GT75's price tag doesn’t seem that ridiculous. If you’re balking at the premium MSI is charging for putting desktop-level parts in a more compact box, this system isn’t for you. But even if it’s not, you have to admit, it is quite impressive. This thing measures 2.2-inches thick and weighs over 10 pounds, plus another 4.5 pounds for the GT75’s two power bricks. When the fans spin up, the system sounds like a mini jet turbine. As you’d expect from a laptop this big and power hungry, battery life isn’t great.